Vishu is a cultural festival celebrated in the Indian state of Kerala and in the Tulunaduregion(Mangalore & Udupi districts) usually in the second week of April in the Gregorian calendar. It marks the new year in accordance with Kolla Varsham the Malayalam calendar.This occasion signifies the sun's transit into the Meda Raasi (first zodiac sign) according to Indian astrological calculations, and represents the vernal equinox. "Vishu" in Sanskrit means "equal". The Malayalam word kani literally means "that which is seen first", so "Vishukkani" means "that which is seen first on Vishu". 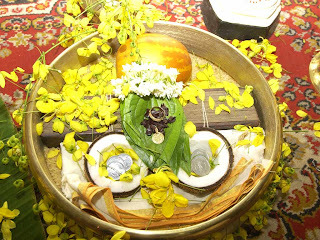 Arranged in the family puja room the night before by the mother in the family, the Vishukkani is a panorama of auspicious items, including flowers, fruits, vegetables, clothes and gold coins. In Jyotiṣa(Indian astrology), Vishnu is seen as the head of Kaala Purusha, the God of Time. As Vishu marks the first day of the Zodiac New Year, it is an appropriate time to offer oblations to Hindu gods. The Vishukkani, also called Kanikanal, is inseparable from Vishu. According to the age-old belief of Malayalees, an auspicious kani (first sight) at dawn on the Vishu day is lucky for the entire year. As a result, the Vishukkani is prepared with a lot of care to make it the most positive sight so as to bring alive a wonderful, propitious year ahead. The responsibility of decorating the Kani belongs to the oldest lady of the house. Vishu is traditionally celebrated as a New Year in the Malayalam Calendar, the day is often considered as the first day of the Zodiac Calendar.They ask Vishu Kani to bring luck and prosperity for the year starting from Vishu Day Medam 1st. But towards the end of last century CE, due to the importance of Onam which comes in August or September, the corresponding month Chingam is considered as first month of the Malayalam Calendar.